c.1768-1813. Tecumseh ("Crounching Tiger" or "Shooting Star") was a major military leader and alliance builder who sought to stop Euro-American expansion into the Ohio Valley area early in the ninteenth century.
" a fire spreading over the hill and valley"
Tecumseh was born about 1768 near present-day Oldtowm. Ohio. He was raised from birth to make war on the encroaching whites by his mother, Methoataske, whose husband, the Shawnee Puckeshinwa, was killed in cold blood by settlers when Tecumseh was a boy. Tecumseh and his mother found him dying. As he watched his father die, Tecumseh vowed to become like " a fire spreading over the hill and valley, consuming the race of dark souls." A few years later, Tecumseh's hatred for the whites was compounded by the murder of CORNSTALK, a Shawnee chief who had been a mentor to the young man. As Euro-American settlement began to explode accross the Appalachians into the Ohio Valley and Great Lakes shortly after 1790, Native resistance expressed itself in attempts at confederation along lines of mutual interest. A confederation that included elements of the Shawnees, Delawares, Wyandots, Miamis, and Ottawas told the United States in 1790 that settlers were not to transgress beyond the Ohio River. Thousands of settlers were surging into the area, ignoring governmental edicts from both sides. The settlers, who were squatters in the Indians' eyes, sought military help after members of the Native confederacy began attacking their settlements. Military expeditions were sent into the Ohio country during 1790 and 1792, but the Native confederacy remained unbowed and unmoved. In 1794, a force under the command of General "Mad Anthony" Wayne defeated the confederacy's warriors at Fallen Timbers ( a battle in which a young Tecumseh fought). In 1795, most of present-day Ohio and parts of Indiana were surrendered at the Treaty of Greenville. Native resistance surged again shortly after the turn of the century under the aegis of Tecumseh. As he came of age after the American Revolution, his influence grew rapidly not only because of his acumen as a statesman and a warrior, but because he forbade torture of prisoners. Both settlers and his Native allies trusted Tecumseh. By the turn of the century, as the number of settlers grew, Tecumseh beagn to assemble the Shawnees, Delawares, Ottawas, Ojibwas, Kickapoos, and Wyandots into a confederation with the aim of establishing a permanent Native state that would act as a buffer zone between the United States to the east and English Canada to the north. One white observer recalled Tecumseh as a commanding speaker. His voice was said to have "resounded over the multitude...his words like a succesion of thunderbolts." He advanced the doctrine that no single Native nation could sell its land without the consent of the entire confederacy that he was building. Rallying Native allies with an appeal for alliance about 1805, Tecumseh said, "Let us unite as brothers, as sons of one Mother Earth...Sell our land? Why not sell the air... Land cannot be sold." He tried to unite the southern tribes by appealing to history. Terretorial governor William Henry Harrison (who would later popularize his coming battle with Tecumseh at Tippecanoe in a succesful campaign for the presicency with the campaign slogan "Tippecanoe and Tyler Too") tried to undermine the growing strength of Tecumseh's Indian union by negotiating treaties of cession with individual tribes. Since only a portion of each tribe or nation's warriors elected to follow Tecumseh, Harrison found it easy enough to find "treaty Indians" among those who did not elect to fight. By 1811, Harrison negotiated at least fifteen treaties, all of which Tecumseh repudiated. Harrison's wariness of Tecumseh's power sprang from a deep respect for him "The implicit obedience and respect which the followers of Tecumseh pay to him is really astonishing and more than any other circumstances bespeaks him as one of those uncommon geniuses, which spring up occasionally to produce revolutions and to overturn the established order of things. If it were not for the vicinity of the United States, he would, perhaps, be the founder of an Empire that would rival in glory Mexico or Peru. No difficulties deter him". For his part, Tecumseh was particularly galled by the fact that Harrison had chosen as his territorial capital the village of Chillicothe, the same site (with the same name) as the Shawnees' former principal settlement. At one treaty council, Tecumseh refused to meet Harrison's terms. Finding himself seated next to Harrison on a bench, Tecumseh slowly but aggressively pushed him off its edge then told Harrison that that was what was happening to his people. During his last conference with Tecumseh, Harrison bid the chief to take a chair. "Your father requests you take a chair," an interpreter told Tecumseh, to which the chief replied, "My father! The sun is my father and the earth is my mother. I will repose upon her bosom." He then sat crosslegged on the ground. Tecumseh was also angry over Harrison's treaty of September 30, 1809, with the Delaware, Potawatomi, Miami, Kickapoo, Wea, and Eeel River peoples. For $8,200 in cash and $2,350 in annuties, Harrison had laid claim for the United Staes to roughly three million acres of rich hunting land along the the Wabash River, in the heart of the area in which Tecumseh wished to erect his Native confederacy. When Tecumseh and his brother , also a Shawnee war chief, complained to Harrison that the treaty terms were unfair, Harrison at first rebuked Tecumseh by saying that the Shawnees had not even been part of the treaty. The implicit refusal to recognize Tecumseh's alliance angered the Indians even more. Realizing that Tecumseh's influence made it politic for him to do so, Harrison agreed to meet with him. At a meeting on August 12, 1810, each side drew up several hundred battle-ready warriors and soldiers. Harrison agreed to relay Tecumseh's complaints to the president, and Tecumseh said that his warriors would join the Americans against the British if Harrison would annul the treaty. Nothing came of Harrison's promises, and in 1811, bands of warriors allied with Tecumseh began ranging out of the settlement of Tippecanoe to terrorize nearby farmsteads and small backwoods settlements. Harrison said he would wipe out Tippecanoe if the raids did not stop; Tecumseh said they would stop when the land signed away under the 1810 treaty was returned. Tecumseh then journeyed southward to bring the Creeks, Chicksaws, and Choctaws into his alliance. He carried the message that he had used to recruit other allies. For the most part the trip failed to bring new allies. During this time, the command of the existing alliance fell to Tecumseh's brother TENSKWATAWA, who was called the Prophet. On September 26, 1811, Harrison decamped at Vincennes with more than nine hundred men, two-thirds of them Indian allies. He built a fort and named it after himself on the present-day site of Terre Haute, Indiana. Harrison then sent two Miamis to the Prophet to demand the return of property Harrison alleged had been stolen in the raids, along with the surrender of Indians he accused of murder. The Miamis did not return to Harrison's camp. The governor's army marched to within sight of Tippecanoe and met with Tenkswatawa, who invited them to make camp, relax, and negotiate. Instead, Harrison's forces set up in battle configurations, and the Prophet's warriors readied an attack. Within two hours of pitched battle, Harrison's forces routed the Indians and burned the village of Tippecanoe as Tenskwatawa's forces scattered into the woods. 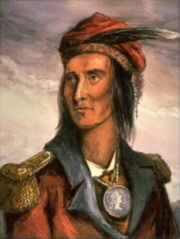 Returning to the devastation from his travels, Tecumseh fled to British Canada, where, during the war of 1812, he was put in command of a force of whites and Indians as a British brigadier general. During the battle in Ontario (Canada), Tecumseh was killed on October 5, 1813. After it, some of the Kentucky militia who had taken part found a body they thought was Tecumseh's and cut strips from it for souvenirs. (His warriors, who had dispersed in panic when Tecumseh died, said later that they had taken his body with them.) Having commited twenty thousand men and $5 million to the cause, the United States had effectively terminated armed Indian resistance in the Ohio Valley and sourrounding areas. A statue called "Tecumseh" plays a major role in traditions at the U.S. Naval Academy. The statue was originally the figurehead of the ship 'Delaware' and, as such was said to portray Tammerund (Saint Tammany), a Delaware chief who befriended William Penn. The figure was renamed "Tecumseh" in 1891 and installed at the academy in Annapolis, Maryland, where its supernatural aid is often requested to help midshipmen pass their exams. The real place where TECUMSEH's bones are is Walpole Island.